The same “tractor” propeller used on standard front-engine R/C airplanes. These contra-rotating props exactly cancel out motor torques during stationary level flight. Opposite pitch gives downdraft. Usually a brushless electric “outrunner” type, which is more efficient, more reliable, and quieter than a brushed motor. Sometimes built into combination fittings with landing struts. Designs that need high ground clearance may adopt helicopter-style skids mounted directly to the body, while designs with no hanging payload may omit landing gear altogether. Shorter booms increase maneuverability, while longer booms increase stability. Booms must be tough to hold up in a crash while interfering with prop downdraft as little as possible. Central “hub” from which booms radiate like spokes on a wheel. Houses battery, avionics, cameras, and sensors. Converts DC battery power into 3-phase AC for driving brushless motors. Interprets input from receiver, GPS module, battery monitor, and onboard sensors. Regulates motor speeds, via ESCs, to provide steering, as well as triggering cameras or other payloads. Controls autopilot and other autonomous functions. Often combines GPS receiver and magnetometer to provide latitude, longitude, elevation, and compass heading from a single device. Often a standard R/C radio receiver unit. 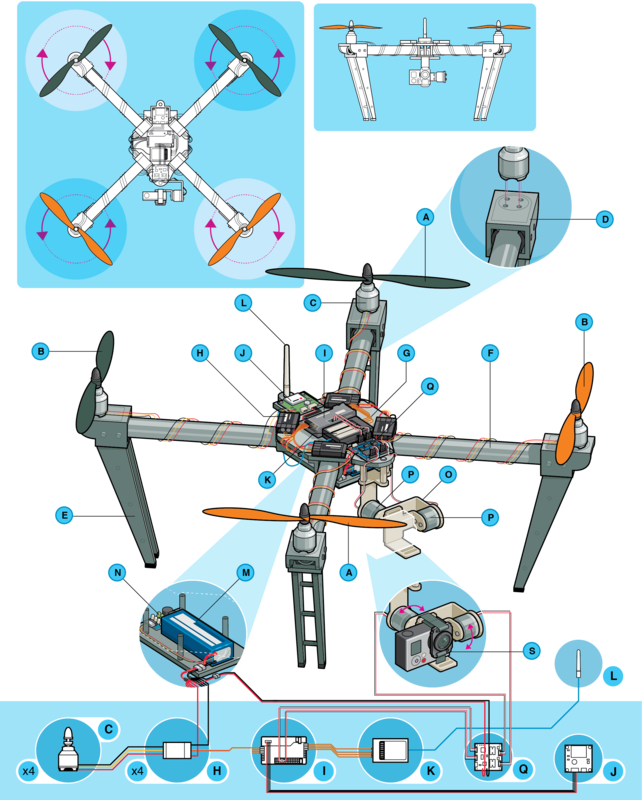 The minimum number of channels needed to control a quad is 4, but 5 is usually recommended. Depending on your receiver, may be a loose wire whip or helical “rubber ducky” type. Lithium polymer (LiPo) batteries offer the best combination of energy density, power density, and lifetime on the market. Provides in-flight power level monitoring to flight controller. Pivoting mount that rotates about 1, 2, or 3 axes to provide stabilization and pointing of cameras or other sensors. Brushless DC motors can be used for direct-drive angular positioning, too, which requires specially-wound coils and dedicated control circuitry that have only recently become commercially available. Allows control of direct-drive brushless gimbal motors as if they were standard hobby servos. GoPro or other compact HD video unit with onboard storage. Real-time streaming is possible with special equipment.